So with 2011 now firmly ensconced on our calendars I thought I should write a review of 2010 as far as my amateur radio activities have gone. I started playing radio again properly half way through 2009 with the rebirth of ClackPak into the Martello Tower Group but for me, 2010 was the year where it’s all taken off in a big way. At the start of the year I had an old FT736R with a BNOS amplifier that could run 90 watts at a push if I drove it really hard. My aerial was a 9 element Vargarda mounted on a pole on the side of the house with questionable coax and a rotator which had failed during the 144MHz Trophy in 2009. I could turn it using a screwdriver to force the contacts together but that was about it. Heath Robinson had nothing on me. I didn’t do anything at home until March when despite the problems mentioned above, I made an entry in the 6S section of the 144/432MHz contest and finished 5th out of 22 entries. Towards the end of March I caught the tail end of a Belgian VHF contest and worked a handful of stations just giving away points. This was great because I didn’t have to turn the aerial at all, I just left it pointing east. It was around this time that I started looking to do some aerial work in the summer. I decided that I wanted to try and increase the aerial height a bit, replace the rotator and the coax and also fit a mast head pre-amp. This plan was going to take a while to execute. It was during the May 144MHz contest at the Martello Tower when G0MBA mentioned that he’d replaced his FT-847. I’d never used an ‘847 but had heard good reports about them. I’d been seriously considering replacing the front end in my FT-736R with the Mutek board but they were difficult to find and very expensive. I asked Tony how much he wanted for the ‘847 and immediately agreed to buy it from him. I picked it up that same evening and used it for the first time in the 6S section of the same contest the very next day, it performed admirably and my ‘736 was consigned to the floor in the corner of the shack, its ultimate destination being eBay a month or so later. I came 7th out of 22 entries in that contest, again with a faulty rotator. June arrived and with it the planned aerial work happened along with a bonus. Not only did a bunch of friends arrive and help me do all the work listed above but we also put up a 5/8 vertical for 28MHz. I’d never had any interest in HF whatsoever except for fleeting ideas about operating 10m. I’d not planned this but as I’d now got an HF wireless, it just seemed the sensible thing to do. It was the right time of year for Sporadic E propagation and so I spent a happy few days working what I considered good DX on 28MHz SSB. In fact it was nothing special but I was very happy with it considering I’d never worked the band before. The end of June saw the Sporadic E reach 144MHz and I worked two Russians over in KO85 square, one of these being my best DX for the year at 2,397km (1,489m). At the start of July was VHF National Field Day. I wasn’t going to be out operating with any large stations and had planned on entering the ‘Fixed Sweeper’ section from home, the aims of this section are to work as many of the registered portable stations as possible only by operating Search and Pounce, fixed sweepers aren’t allowed to call CQ. Each registered station is a multiplier and with 55 stations registered that was a potential lot of multipliers. I’d spent some time researching the list of registered stations beforehand so that I’d hopefully know roughly where each one was going to be so that I could spend time beaming towards them and tuning around the band. It was an enjoyable contest but it was a very hard slog as not being allowed to call CQ makes it very difficult. The highlights were working Spain, Austria and Denmark around sunrise which was very nice for 2m. The hard work and research paid off as I ended up winning the FSR section which had 16 entries. I carried on operating 28MHz making QSOs into South America and most of Europe with no real problems. I had some work carried out on the FT-847, replacing the 144MHz SO239 connector with an N-Type and fitting an INRAD filter to the front end, this was really useful because there’s a site that a large contest group use on a regular basis just a few km from me and without that filter I knew I was going to struggle to operate. This filter made a big difference and I can recommend it to any FT-847 owner. In August, thoughts of operating on the other HF bands had come into my head and I bought an SGC Smartuner and installed a ‘long’ wire down the garden. My first HF QSO was on the 28th August on 20m with an Italian. I’m really enjoying operating on HF although I’m suffering from the limitations of the long wire and it’s been documented elsewhere on this blog that I need to get it replaced as soon as possible. At the start of September was the 144MHz Trophy contest and I’d planned to work this for the full 24 hours to give both me and my station a good test. Conditions were pretty flat and the tropo that reached a large part of the country didn’t get as far as me so I was unable to work into Spain again. It was a good contest though and I was happy to be placed second behind Bryn, G4DEZ in the SF section. I’d bought myself a new amplifier in time for this contest and now I can run 200 watts on 144MHz with ease. Skip forward to October and there was perhaps the largest and longest tropo opening I’ve ever experienced! Conditions were up for an extended period into Germany, Sweden, Poland and Denmark. I picked up a number of new squares and a couple of new countries during this opening. There was a brief tropo opening in December which just reached me and I was able to work another new square, IN73 in northern Spain. 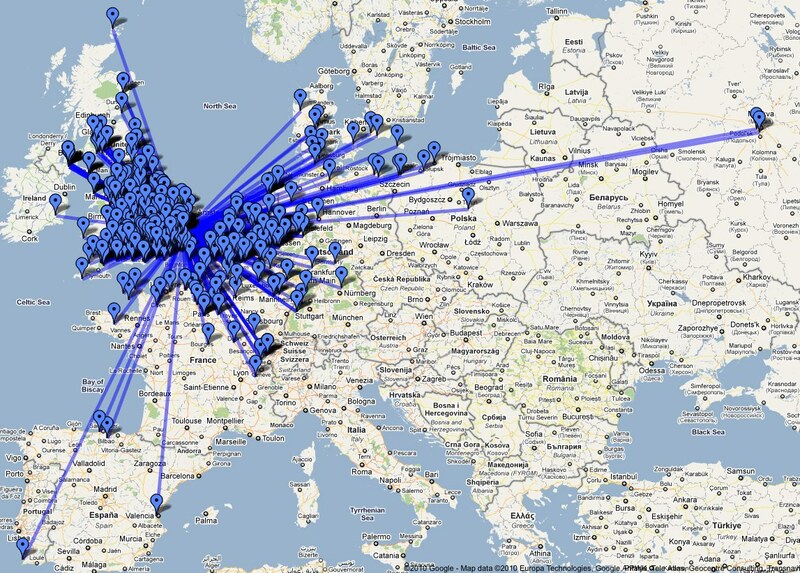 My total square count for 2010 was 72 and I’ve worked 19 DXCC entities, here’s a map of all my VHF QSOs in 2010. That brings us to the start of 2011. I’m looking forward to this year with enthusiasm, I’m really keen to get my HF aerial replaced and I’m looking forward to the challenge which is this QSO365 project, I’ve already had some QSOs today but more on those in a future post. 73 and Happy New Year. This entry was posted in Amateur radio, Review and tagged QSO365. Bookmark the permalink.